The dive boats at Siladen Resort and Spa arrive and depart from the beach near the resort entrance and the dive shack. They are driven by outboard motors, and at the stern have such shallow draft that they can back in to the beach; a line is run to a nearby tree, the motors are pulled out of the water, and the boat can be pulled all the way up to the beach. It was possible to get on and off the boats without getting our feet wet (though of course nobody cared when we were going diving). The resort’s working dive boats were moored just off the beach nearby. When we were there, one of the resort’s boats had been pulled up on the sand above the high water mark. It might have been there for repairs, but it looked to me more like an iconic landmark, pulled upon the beach and painted neatly to be a landmark and bit of character — and also an invitation. A sign facing outward beneath the boat’s awning read “Diving is Fun with Siladen Resort and Spa.” True story. In morning and evening the glossy paint on that boat picked up the sun and seemed almost to glow. 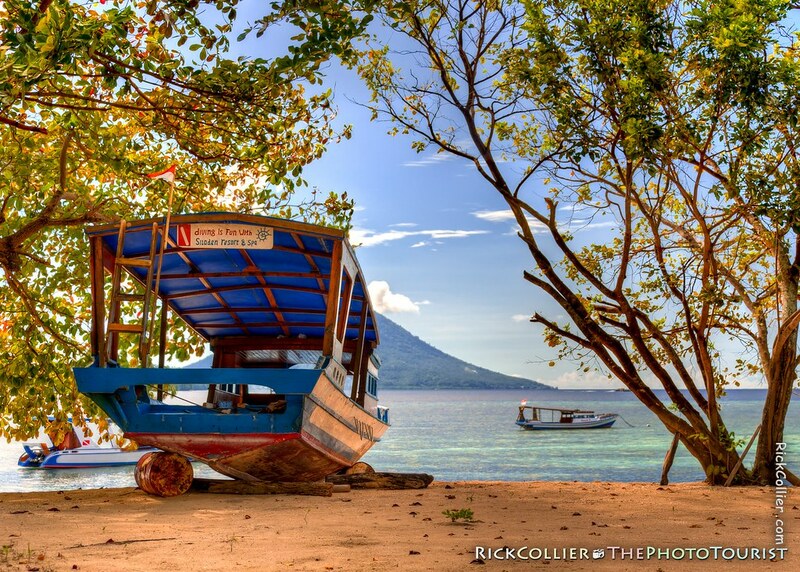 The neat beach, colorful ocean, boats moored nearby, and the volcanic island Manado Tua in the background just made the scene more appealing. One afternoon I walked up the beach to attempt an HDR capture. Today in North Sulawesi it is partly sunny, 84 degrees Fahrenheit (29C), with scattered clouds and occasional rain or thunder storms. Humidity is in the range of 65 percent. Kinda wish I was right there now, relaxing in the shade on this beach …. Diving is Fun is a post from: thePhotoTourist.com.Images and text copyright © Rick Collier and thePhotoTourist. All rights reserved. This entry was posted on Sunday, February 27th, 2011 at 22:30 pm. It is filed under thePhotoTourist and tagged with beach, boat, Bunaken, Bunaken National Park, Bunaken Park, dive, dive boat, diving, diving is fun, evening, fun, Indonesia, island, Land & Air, Manado, Manado Tua, North Sulawesi, ocean, photo, Photo Tourist, PhotoTourist, resort, sand, sea, sea grape, Siladen, Siladen Island, Siladen Resort, Siladen Resort and Spa, Sulawesi, sunset, the Photo Tourist, thePhotoTourist, tourism, tourist, tree, trees, view. You can follow any responses to this entry through the RSS 2.0 feed.